“No human leader is expected to be personally strong or self-sufficient in all aspects of governance”. This is one of the many reasonable submissions by Chief General Olusegun Matthew Okikiola Obasanjo, Ph.D, GCFR in his celebrated Open Letter to the President, General Muhammadu Buhari released on January 23, 2018. No doubt there are as many more reasonable submissions, from the wily general, as loads of unreasonable ones in that “Special Press Statement, THE WAY OUT: A CLARION CALL FOR COALITION FOR NIGERIA MOVEMENT”. The principal focus of the statement as its title indicates is about the Coalition for Nigeria Movement. In my view it is a most welcome help for General Buhari in his plan to return in 2019. It is not just helpful because it is a wake-up call for him and his handlers who have closeted and pocketed him and the Government, all of the past three years. For Obasanjo his Clarion Call and Coalition for Nigeria is the way to go now for our problems to be resolved. Problems he has failed to resolve all of his years in the corridors of power all the years of Nigeria as a self ruling entity being either a member of the Military caucuses that run and ruin us, a Federal Minister or President/Head of State. At other times he has remained an unappointed Advisor to Power for every Government whenever he is out of Government and more when out of favour. Since his “bombing” of General Buhari and his Government, as most commentators in the media so aptly termed it, that letter has been the talk of the town. It has been consistently so, even in Kano where an epic battle for supremacy has been raging on between two ex-PDP dons all now in General Buhari’s APC, former Governor Rabi’u Musa Kwankwaso, now Senator, and current Governor, Abdullahi Umar Ganduje, who was Kwankwaso’s former Deputy, of two terms and close confidante of nearly two decades. What struck me most from the letter after I sat down and read it through again and again is that Obasanjo has actually been of the greatest help to GMB, the Peoples General. Rather than pummel Buhari to extinction with his epistle, as he did his godson, Goodluck Jonathan, whom he “bombed” in his own letter, that he titled, “BEFORE IT IS TOO LATE..”, this letter at Buhari is a lot milder, with its submission that we shouldn’t expect perfection from any human leader. We shouldn’t. Only Prophets of God, sent by the Almighty have that rare privilege. And Obasanjo, is himself abundant proof of that as a two-term leader, many consider one of the most celebrated failures of Nigerian governance. He has, obviously due to abundant good health and the many bounties of the Good Lord, not been able to keep away from the sweet nectar of power. Obasanjo was Military Vice President to General Murtala Ramat Muhammad (1975/’76) and Military President between 1976 to1979. In his outing as vice president he was in the shadows of his fast-paced and revolutionary principal, General Murtala Muhammed, who among many innovations introduced the Low Profile concept of administration as a marked departure from the highlife flamboyance of the General Gowon regime. Obasanjo reversed the Low Profile regime, with its belt tightening and use of modest locally-assembled Peugeot cars for Government. It was the Obasanjo Government from 1976 to 1979 that spawned the first set of stupendously wealthy military officers whose wealth can only be traced to their time in office, a tradition furthered by subsequent military regimes. It was the same Obasanjo Government as a continuum of General Murtala brutally assassinated by revanchists that introduced the over centralized Military style Presidential form of Governance that has been the bane of Nigerian politics since 1979. The return government of Obasanjo as elected civilian President in 1999 on the platform of PDP was to introduce a lot of the problems we face in governance. He established the precedent of President and Governor as Party Leader that has been hobbling our democracy all these years. These and many other troubles are what the first truly democratically elected civilian APC Government of General Buhari has been grappling with since 2015. Obasanjo, having escaped the hangman’s noose for suspected involvement in a coup attempt against Late General Sani Abacha disappointed most of the patriots who thought he was born again enough to lead the renaissance the times thirsted for in his 1999 incarnation as Nigeria’s President and Head of State. Obasanjo refused to copy Mandela’s laudable one-term tenure after setting South Africa on course. That was expected of a man who was literally installed by the military. 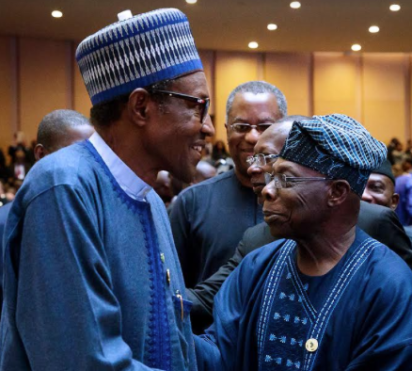 The post GMB and Obasanjo’s 2019 Coalition for Nigeria(1) appeared first on Vanguard News.